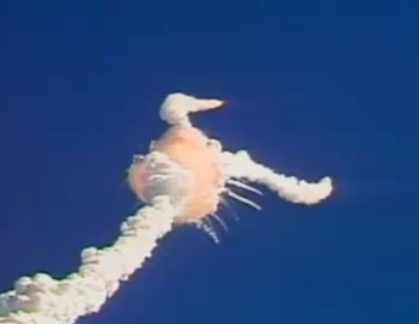 Millions of Americans watch horror as the Space Shuttle Challenger explodes 1 minute and 13 seconds after lift-off. It was the winter of my 8th grade year. I was more concerned with my jr. high life of school, homework and which girl liked which boy than I was with anything else. I listened to Whitney Houston and watched Family Ties or The Cosby Show, and only barely paid attention to what the nightly news reported about President Reagan, Margaret Thatcher and Mikhail Gorbachev and other leaders might be doing around the world. But all of that changed on the day the Challenger exploded. I recall coming home from school and feeling mildly annoyed that nothing was on TV except breaking news reports. I never sat down to listen to what the latest world tragedy might be. I just dashed off to my bedroom to start my homework. It wasn’t long before a friend called me. Paige, have you heard? A space shuttle exploded! It killed all the astronauts, including the one that was a teacher! Overwhelmed with feelings of guilt, I could barely concentrate on what my friend was telling me. Moments later I hung up the phone, switched the TV back on and watched the images replay again and again. The group of seven astronauts smiling and waving to the small group of family and friends as they walked toward the shuttle. The giant white shuttle, pointed heavenward. The gradual lifting of the shuttle leaving behind a white trail of smoke against the brilliant blue winter sky. The explosion causing one trail to turn into two. I felt sick to my stomach, yet I was unable to turn my face away from the TV. All I wanted was for the story to be false, for it all to be a big mistake, for the astronauts to have somehow survived the explosion. But it was true. The shuttle exploded, leaving nothing behind but the shock and grief. The entire nation mourned. I was 13 years old … and it was the first time I can ever recall being emotionally affected by a national tragedy. Class, today’s writing assignment is to write about yesterday’s tragedy with the Space Shuttle Challenger. You can record the event or write down your reaction. My 8th grade English teacher gave out the assignment, and for a long time nothing could be heard but pencils scratching across loose leaf paper. I don’t recall whether or not these essays were turned in that day or if we spent several days editing those first drafts. I don’t recall if it was intended as a bigger graded assignment, or if it was just counted as a daily activity and checked for completion. But I do remember the time I spent writing that day, and how I wrote about being able to see a bit of every American on board that shuttle … whites, blacks, Asians, men, women and even a teacher. I wrote about the sorrow of the tragedy, and how as Americans we all lost something on that awful morning. Up until then, I never knew writing could be cathartic to the soul. A week or so later, Mrs. Swayze announced that a small number of the essays written about the Challenger tragedy would be published in our tiny school’s newspaper. Mine was one of the essays chosen. It was the first time when something I wrote was published and read by others. I recall the comments I received from friends and even other teachers at the school, telling me how they felt comforted by the words I had written. Up until then, I never knew how gratifying it was to have readers who found a measure of enjoyment or got some sort of pleasure from reading my thoughts. Somewhere, among all the boxes where I’ve packed up the scraps and pieces of my childhood, there remains a copy of that old school newspaper. Every five or six years, I will happen across it as I search for something else I know must be tossed in with the boxes of school yearbooks and 4-H ribbons and other items that tell the story of who I was before I grew into an adult. Whenever I do, I always take a moment to pause and reread that essay. Tears well up in my eyes as I am transported back to that January so long ago, remembering the hours I sat watching the tragedy replayed on the TV screen and the scribbling of my pencil as I tried to write about that deep, sorrowful pain and what it meant to me and to my nation. January 28, 1986 was a day of national tragedy and sorrow. It was a day when I grew up just a little bit more, realizing for the first time that world events affected me as an individual and as an American citizen. It also happened to be the day before the day when I became a writer. Exactly, Mrs. Diane … quite often my best writing is that which comes from the deepest hurts and sorrows of my life. Maybe you could reprint your 8th grade essay?! I resonate with you in that I never paid much attention to the news when I was growing up except for the day President Kennedy got shot (I was 11). But we do seem to write about things that affect us. Now I write about life situations that hurt people. Hopefully I can show them how God wants to help us get through stuff, if we just turn to Him in genuine faith. May I post your article on my google+ site? Dear friend, I so remember that assignment. I believe I chose to write a poem. I remember the way our room felt. So quiet and still. There wasn’t any sly note passing that day. You’ve always been my inspirational writer by putting into words the things my own mouth couldn’t utter. Cindi, I remember us talking about that assignment much later on … maybe even in high school or college. We agreed that we remembered that day so vividly because the writing helped us process through the experience of that tragedy. At the time it seemed so big … and I guess it still feels that way to me. In the years since, every time I watch a space shuttle launch, I hold my breath and pray it doesn’t explode as it hurtles through the atmosphere. And when the Space Shuttle Columbia broke apart as it reentered the earth’s atmosphere, it sort of felt like the Challenger all over, even though it was years afterwards. One other thing … I remember someone else (and I am fairly certain this was your poem) talked about the red of the explosion, the white of the smoke and the blue of the sky reminding them of the red, white and blue of the American flag. Red for bloodshed, white for purity, blue for courage and honor. I was encouraged by those words then … still am. American patriotism is a dying thing, but I am glad that my generation didn’t miss out on the gift of love of country. Thanks for being the sort of friend who reads what I write … and understanding my heart. This is such a beautiful story, and what a great job your teacher did of taking a negative situation and using it to inspire her students! I love hearing of the many ways God can bring blessings out of times of tragedy…. Thanks, John Mark. It is definitely a special personal memory, despite being laced with such national sorrow. And God has used it to bless me over and over these last 29 years. Maybe you could reprint your 8th grade essay…I would love to read it!! !